MIT researchers helped develop a theory that promised much more efficient data networks; then they were the first to put it into practice. Today, data traveling over the Internet are much like crates of oranges traveling the interstates in the back of a truck. The data are loaded in at one end, unloaded at the other, and nothing much happens to them in between. About 10 years ago, electrical engineers suggested that bundles of data could be transmitted over a network more efficiently if, instead of passing unaltered from one end to the other, they were scrambled together along the way and unscrambled at the end. In 2003, MIT electrical engineering professor Muriel Médard and her colleagues proved the counterintuitive result that, in many cases, the best way to scramble data together was to do it randomly. Last year, the paper in which the researchers presented their findings received an award from the Institute of Electrical and Electronics Engineers (IEEE), which recognized its seminal contributions to the field that’s come to be known as “network coding.” But the same year, the IEEE honored another network-coding paper, in which MIT researchers played the leading role: the paper that, in 2006, presented the first practical implementation of network coding. The first article in this two-part series presented a simple example of how network coding increases efficiency. Suppose that two laptops are trying to send each other messages simultaneously over the Wi-Fi network in a coffee shop. Ordinarily, the first laptop would send its message to the coffee shop’s Wi-Fi router, which would forward it to the second laptop. The second laptop would send its message to the router, which would forward it to the first laptop. That’s four total transmissions. But with network coding, the router would instead combine the two laptops’ messages into a hybrid message, which it would broadcast to both laptops, reducing the total number of transmissions to just three. Each laptop would then subtract the message it had sent from the hybrid to recover the message intended for it. Dina Katabi, an associate professor of electrical engineering and computer science; Médard; MIT grad students Sachin Katti and Hariharan Rahul (Katti now teaches at Stanford; Rahul still works with Katabi at MIT); and Cambridge University’s Jon Crowcroft and Wenjun Hu generalized this approach to a network with many different transmitters and receivers. The researchers blanketed two floors of the MIT Computer Science and Artificial Intelligence Lab with wireless routers programmed to execute their network coding scheme. They then used wireless devices to exchange test data over the network. Like all information sent over modern networks, the test data were broken up into smaller “packets” of information for transmission. And as is typical with most wireless networks, electromagnetic interference, physical obstacles, and sheer distance from the wireless devices meant that no one router received all the packets. In the MIT network, however, routers also told their neighbors which packets they had received. A router would use that information when preparing mixed packets to send to its neighbors. Consider a router that has four packets in its memory, A, B, C and D. It knows that one of its neighbors also has A and C; another neighbor has A and D; and a third neighbor has C and D. So it creates a single mixed packet that combines packets A, C and D. The first neighbor uses that packet to recover D; the second neighbor uses it to recover C; and the third neighbor uses it to recover A. Since the mixed packets are the same size as the packets they combine, a single packet conveys three times as much information as it would have in an ordinary wireless network. Indeed, Katabi has found a way to make networks even more efficient by exploiting the physical characteristics of actual wireless channels. In the network described in the award-winning paper, wireless routers received electromagnetic signals, translated them into bits, mixed the bits together, and then translated the bits back into electromagnetic signals. But signals sent from different transmitters naturally blend together physically. That blending is usually a nuisance: the signals have to be separated before data can be extracted from them. But Katabi built another experimental wireless network in which routers don’t disentangle blended signals; they just amplify and forward them. It turns out that the network coding techniques that work at the level of the bit can be extended to reconstruct the original signals, without lots of intermediate translations. Médard, too, has been concerned with the practical implementation of network coding, if at a higher level of abstraction. 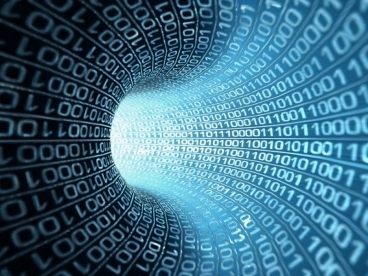 The Internet is designed so that a computer or phone receiving information will generally acknowledge the arrival of data packets. If an acknowledgment fails, the sender knows that it has to resend the missing packet. But if, as with network coding, all the packets are mixed together, which packet does the receiver acknowledge? Médard and her colleagues have found a practical way to answer that question, a system wherein each hybrid packet identifies the source packets it combines. The receiver then keeps the sender apprised of the source packets represented in the hybrids it’s received. Médard and her colleagues are also working on applications of network coding in streaming video, where different means of combining data can be tailored to the different image resolutions of receiving devices. And they’re considering cases where network coding can be applied to several different networks at once. If, for instance, your phone can connect to both Wi-Fi networks and the cellular network, then for large files, you might want to download data over both networks at once. But the cellular network could be significantly more expensive to use than a local Wi-Fi network, so you would want to minimize the amount of data transmitted over it. Network coding can help coordinate transmissions over the two networks, to maximize efficiency while minimizing cost.